I cannot stop coming up with squash recipes! Gotta get them in while we can right? One of the ways I’ve been enjoying squash these days is to char the skin, either on a grill or in the oven. It’s delightfully crunchy and tasty, especially next to a slightly acidic sauce. This dish plays like a warm salad but feeds like a hearty, meaty dish. 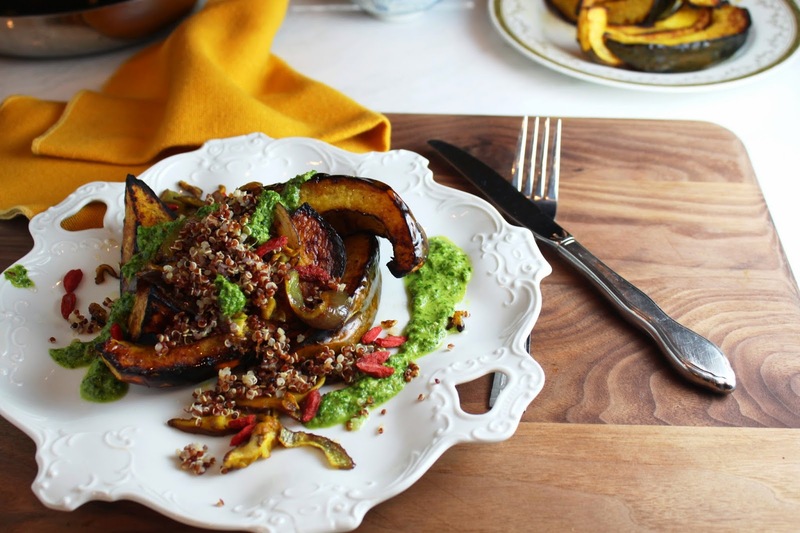 I’ve used both acorn squash and butternut squash, and they are both great in this dish. Use both for the best variety. Any grain would work in this salad. Try brown rice, farro or wheat berries. Make the chimichurri sauce (below) and set aside. Turn the oven broiler to high. Cover a sheet pan with aluminum foil. Cut and clean the squash: cut the squash in half across the stem. Clean out the seeds and pulp. Now cut each half into 4-6 slices (like moon slivers). Place on the foiled sheet and drizzle with the olive oil and fresh black pepper and toss well. Depending on the size of your oven, broiler and sheet pan, you may need to broil the squash in two batches. Place the squash under the broiler until nice char marks appear. Flip sides and broil again. Test the squash to be sure it is fork tender throughout. 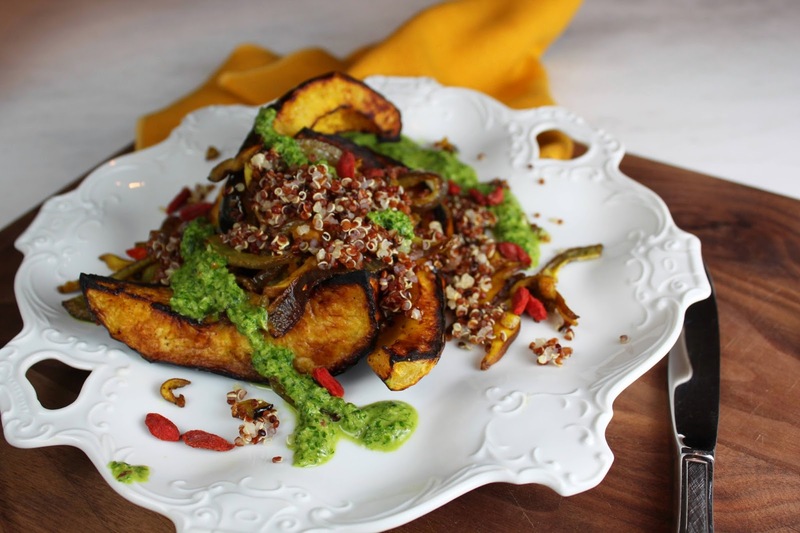 While the squash is broiling: Bring the water to a boil, add the quinoa, cover and lower to a simmer for 10 -15 minutes, until quinoa is at desired tenderness. While the quinoa is cooking: melt the coconut oil in a fry pan over medium heat, add the onions and toss well. Cook for about 5 minutes, tossing often, until the onions begin to soften but still have texture, their edges may get caramelized, and that,s ok. Add in the garlic and mushrooms, lower the heat slightly and cook another 5 minutes, just to wilt the mushrooms a bit. Pile the roasted squash on a platter. Top with the mushrooms and quinoa. Now drizzle with the chimichurri sauce and sprinkle with the goji berries. Toss all the ingredients in blender and blend. Start with only half cup of the olive oil and add more if you want a thinner sauce. Happy Healthy Tips: If you are eating the squash skin, spend the money on an organic squash. Time saving tip: make the quinoa and chimichurri sauce ahead of time.